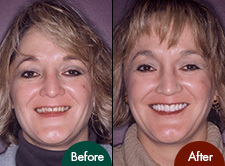 Cosmetic dentistry is the process of improving the esthetics of your smile. If you are interested in cosmetic dentistry we have an extensive library of before and after photographs that we would be pleased to share with you in our office. 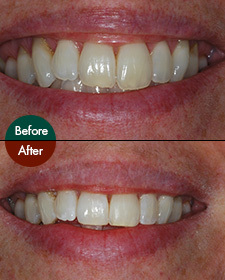 Alternately, you might want to view our online gallery that highlights case studies of Concept Dental Centre patients. Dr. Rickards has performed a lot of cosmetic procedures during his more than 30 years of experience in dentistry and has studied and taught cosmetic dentistry as well. It is important to note that every individual's needs are different. 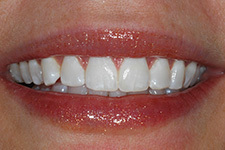 Porcelain laminate veneers can be used to change the shape, size, colour and position of your teeth in just three weeks! These veneers are a more complex cosmetic procedure than direct bonding and consist of thin pieces of porcelain that are specially fabricated to enhance your smile. When you decide on a porcelain laminate veneer your tooth or teeth will be slightly prepared or modified and an impression will be taken and sent to the lab. 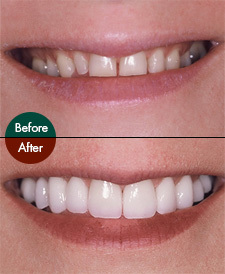 The veneers will be made to bond to your remaining tooth structure. The process will be completed in two appointments. Between appointments you will be provided with temporaries that are placed to protect your teeth. Direct Bonding is a "one step" process where the white filling material is bonded to your teeth to close gaps, lengthen teeth and mask discolourations. Direct bonding does not last as long as veneers, but is an excellent, less costly alternative to porcelain laminate veneers. 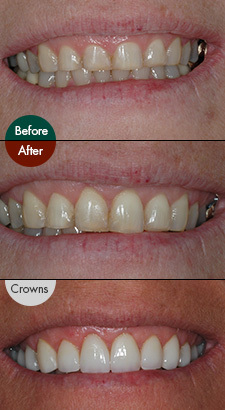 Direct bonding often requires no freezing and can be completed in one appointment. 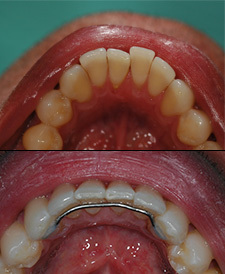 Direct bonding is a very technique sensitive procedure and patients undergo specific evaluation before it is considered as a treatment option. If you have a smile that shows too much gum tissue or your tissues are unevenly contoured, you may be a candidate for a Gingivectomy or gum recontouring. The procedure can be performed in a variety of ways and usually only requires one initial appointment and a follow up examination. The results of gum recontouring can be very dramatic, whether done alone or in conjunction with other cosmetic procedures. A common procedure done along with tissue recontouring is the the recontouring of teeth, typically the front six either upper or lower. Reshaping the biting edges and the general shape of these teeth can have dramatic results whether done alone or in conjunction with other cosmetic procedures. Many times a patient wants to improve their smile but cannot afford crowns/veneers, this is where (in many cases) I can make a dramatic improvement with minimal cost and immediate results. Clear Aligners is a new technique and a good alternative to traditional orthodontics. Clear Aligners are a series of thin, clear, removable plastic retainers created for minor tooth repositioning. Impressions are taken of the upper and lower teeth, and the aligner is then custom-fabricated to progressively advance teeth into their ideal positions. 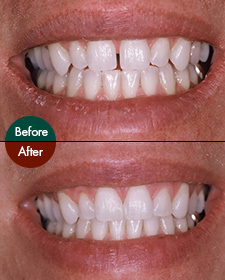 Clear aligner is a cost effective alternative to traditional orthodontics. The Clear Aligner is worn all day and night and is only removed for eating and cleaning and a monthly appointment will be scheduled until treatment is complete. At each visit the appliance will be activated to move certain teeth into specific positions. When treatment is complete, a fixed retainer may be placed along the tongue side of the teeth to eliminate the risk of teeth moving back toward their original position and having to be re-treated. Tooth whitening is a bleaching process that lightens discoloured enamel and dentin (the second layer of tooth structure). A treatment takes about two hours from start to finish. The carbamide peroxide (whitening gel) is activated by using an intense blue light over the gel, and thin custom trays are fabricated to fit over your teeth and hold the whitening gel in place. Research and clinical studies indicate that whitening teeth with carbamide peroxide under the supervision of a dentist is safe for both your teeth and gums and we will monitor the process to ensure your success and comfort. If you would like to know whether you are a candidate for whitening, please feel free to discuss your options with Dr. Rickards or any of our staff members at Concept Dental Centre. 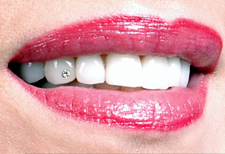 Diamond placement on select teeth can be a subtle yet effective way of adding a touch of something special to your smile. Placement and size of a diamond are determined by you and Dr. Rickards. Diamonds are provided and the total cost of the procedure is $400.00. This relatively straight forward procedure can sometimes be done without anesthetic, and due to the very conservative preparation of this procedure, there is little removed from your tooth. The effectiveness of the bond is superior and should last a lifetime. As we age, our skin changes. Over time, repetitive movements of the facial muscles (such as squinting and frowning) , loss of volume and elasticity, and the forces of gravity cause unwanted wrinkles and folds to develop. BOTOX® Cosmetics is a natural purified protein that relaxes wrinkle causing muscles, creating a smooth and improved appearance. It is administered via a few tiny injections of highly purified protein into the muscle to block nerve impulses that trigger wrinkle-causing muscle contraction. This is a simple and quick, minimally invasive treatment that delivers dramatic results with no down time. Dr.Rickards has taken his Botox training with the Pacific Training Institute for Facial Aesthetics (PTIFA), a training facility where dentists, physicians and other health care professionals are instructed in the art of both Botox Cosmetic and Botox Therapeutic, using the most advanced, anatomy driven scientifically based training methods available. After restoring your smile we may recommend you consider the final touches of your new image with cosmetic injectables. 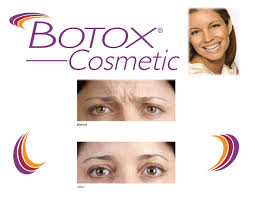 BOTOX® Cosmetics will help you relax the muscles around your mouth that could be creating lines; or fillers to enhance your lips or reduce the folds and lines on the lower part of your face. As part of our comprehensive treatment planning to restore your smile, we are proud to work with like minded organizations that share in the dedication to increasing your self-esteem. Visit Vanishings.ca for more details on cosmetic injectables.